No one plays a greater role in the home than Mom. In this new DVD, based on the best-selling book, Karol Ladd will help ensure that a mother's impact is positive. In this much-awaited entry into the successful Power of a Positive series, women will learn and practice seven simple principles for shaping their families whether they are stay-at-home moms or working mothers. Encouragement, prayer, attitude, relationships, example, moral standards, and love and forgiveness are enthusiastically discussed as women discover how to become the moms they've always wanted to be. 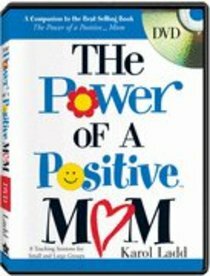 About "The Power of a Positive Mom"
Karol Ladd, a former teacher, has authored twenty-one books, including the best-selling Silver Angel Award-winning The Power of a Positive Mom. She offers lasting hope and biblical truth to women around the world. A gifted communicator and dynamic leader, Karol is founder, and president of Positive Life Principles, Inc. and her vivacious personality makes her a popular speaker to women's organizations, church groups, and corporate events. She is co-founder of a character-building club for young girls called USA Sonshine Girls and serves on several educational boards. Karol and her husband, Curt, have two daughters and reside in Dallas, Texas. - Publisher.